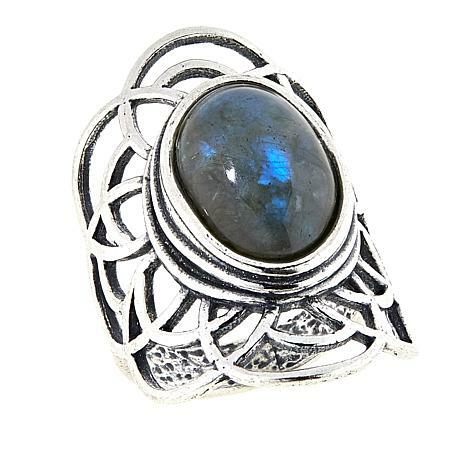 Stand out from the crowd with this bold, labradorite ring. 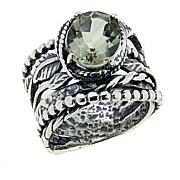 It features a beautiful labradorite cabochon, expertly-cut to showcase the stone's natural, iridescent play of color. 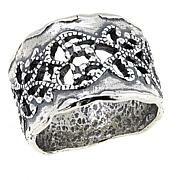 Framed in large loops of oxidized sterling silver, this flower-like piece is sure to become a jewelry-box favorite! 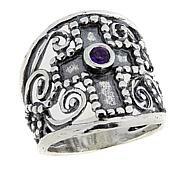 Really liked the design but the stone had two prominent spotson it which distracted from its beauty. Also, it ran about 1/2 size bigger than a usual size 7. Had to return. I loved the conceptual design of this ring, unfortunately I sent it back because the labradorite stone was of low quality in my opinion. Very gray in color with little iridescent highlights. 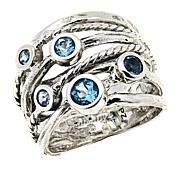 I really like the style and size of this ring but the stone was very disappointing. There was no flash at all. Returning.